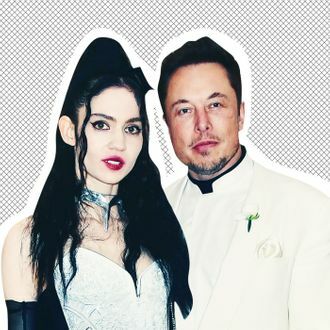 Not only are Grimes and Elon Musk still dating, they are now talking about each other publicly, albeit vaguely. Groaning aside, she had only (reluctant) positive things to say about the Tesla mogul and non-weed-smoker. “Look, I love him, he’s great,” she said (the magazine notes here that she won’t refer to Musk by name, but is speaking about him). Musk, for his part, had just one sentence to sum up his feelings about Grimes: “I love c’s wild fae artistic creativity and hyper intense work ethic.” he told WSJ in an email.